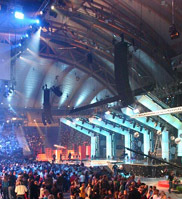 During the Junior Eurovision Song Contest 2004 the Swedish Stuntgroup rigged two very large and long wires. The norwegian stunt woman Thea Fjortoft slided down the long wire with a flaming snowboard attached to her feet. Thea Fjortoft is the woman on the left, the other one is the host Nadia.